This large cozy updated chalet offers four big well-separated bedrooms, granite kitchen with counter bar, large great room with local stone tone fireplace, game room with brick fireplace and good supply of games for the game table. Toys for tots to adults. We are a short walk from the ski slopes and resort center. Sun/stargazing deck overlooking 16th hole of golf course. . Light and Bright with floor to ceiling windows on both levels. Enjoy spectacular view from large windows in living room and game room. Wireless access. We provide a lake access pass for summer beach enjoyment - something other homes don't offer. Small plane Pilot? Fly-in to our private airport and walk to the house. Need a port-a-cirib? We have one. Tubes for the lake? We have them for you. Older children can walk to recreation area (Mini golf, golf, downhill mountain biking trails, rock climbing, zip line) making it handy for Moms and Dads. Washer and Dryer, fully equipped granite kitchen, Central heat and air conditioning. Relax on the screened porch with your book and take in the view. Two grills - charcoal and electric. Swing in the hammock in season. Borrow our kayak to take to the lake or rent them there. See 101 activities sheet on our buffet for lovely day excursions. Many of our guests come back year after year. You hope you are among them! Please NO PETS. This is a non-smoking house but has a comfortable screened porch with table if there are smokers in your party. LIMIT 8 Guests. The house is very comfortable for up to 8 with two private bedrooms on EACH LEVEL. (4 total) Great for four couples or multiple generations. Keywords: Large four bedroom , two bath redwood chalet with large stone fireplace and jetted tub, Granite country kitchen with serving bar. Screened porch, star grazing deck, Perfect for multi-generational families. Supplied with sleds, tubs and other sports equipment. Bryce resort Golf Course, the Ski Lifts, or the Recreation Area which offers a Pro Shop, Mini Golf, Tennis, Hiking, Rock Climbing, Zip Lining, Euro Bungee, Summer and Winter Tubing Hill, Mountain Biking Trails, Private Airport, Basketball Courts and Tennis Courts. The Copper Kettle Bar & Lounge at the main lodge offers food and drinks 7 nights a week. Events at Bryce Resort are year-round and include: Craft Shows, Wine Festivals, Fireworks, Tough Mudders, Runs, Races, Dinners, and Cook-offs, Mountain Biking events. Lake Laura is just 1.5 miles away and offers: Fishing, Swimming, Paddle Boating, Kayaking, Beach Front, and Hiking Trails. The home is centrally located to more than 7 different wineries and vineyards including: Shenandoah, Cave Ridge, Wolf Gap, Kindred Pointe, Muse, Wisteria, and Cedar Creek. Easy day trips in all directions include: Multiple Cavern Tours, Museums, War Memorials, National Parks, The Shenandoah River (Fly Fishing, Rafting, and Tubing), The Blue Ridge Mountains, Historic Sites, Orchards, Farms, Antique Shops, Shenandoah Music Festival Grounds, Winchester, Harrisonburg, and James Madison University. Washington D.C. is just a quick 2 hour drive away so whether you’re looking for a fun-filled adventure or just a relaxing weekend away from the hustle and bustle, this property will enable you to truly customize your vacation. Two professional educators built this house for our family vacations and recently renovated it for our future retirement home. Our big granite kitchen and many amenities are your gain. Many of our renters come back year after year ( up to three generations). The house was named 'Niblick' by Martha's Scottish father. Niblick means 'short iron' because we are a short distance to two golf greens. 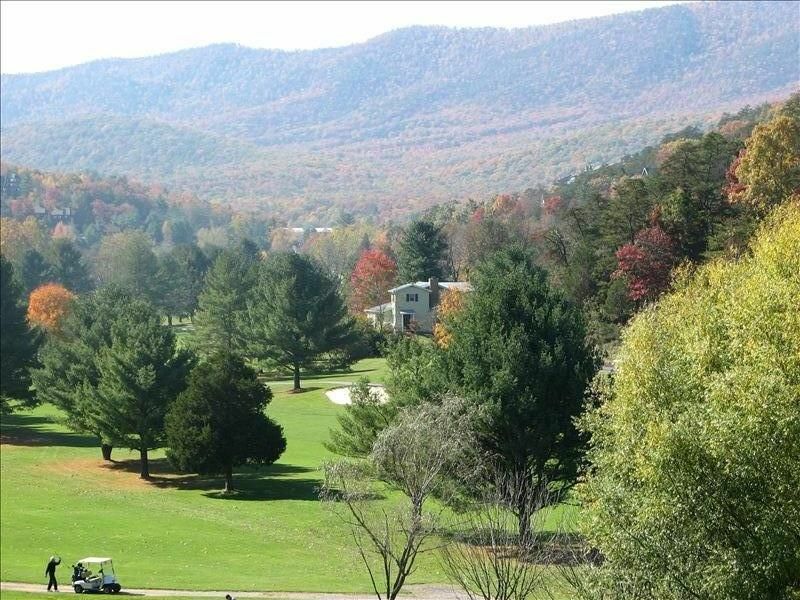 Our location on the golf course gives us lovely unobstructed views of the GW National Forest mountain range for the ultimate mountain feel. The house has spurred many creative endeavors for us and groups we have served - as well as being a great place to just relax. Our chalet is close to the main lodge for skiers, bikers and golfers convenience. Bryce is a lovely four season ski resort and our home is updated with granite kitchen and great porches and a million dollar view. In summer watch the golfers from our hammock or screened porch. In winter you can walk to the ski lodge (7 minutes), golf shop, mini golf, rock wall, zip wire and bike course from our house (teens run back and forth). We are so central to the resort yet peacefully private - the best of both worlds. Short drive (1 mile) from Lake Laura for boating and swimming. We love the beautiful well maintained golf course as it winds through the view. Hiking in nearby George Washington National Forest. Only two hours from DC but feels like a world away. The Shenandoah Valley has so many places to explore. Both bathrooms have tubs and showers. Jetted tub and heated floor in new lower level bathroom. Enjoy 45 lake lake with beach and rental boats. Golf, tennis, lift assisted bike trails, ski, zip lining, community pool. Home sits on 16th hole of the golf course - watch golfers on this long par five from screened porch and sun deck. View of 10th and 16th holes. Lovely panoramic view of the Great North Mountain range across golf course. We provide linens (on beds) and a towel set for each person booked. Large stone fireplace in the livning room and brick fireplace in the game room. Bath towel and wash cloth for each person. Spares in laundry room. Large upper level living room with couch and love seat with floor to ceiling windows with awesome views and large TV. Spices and staples are available for your use. Granite serving and breakfast bar. Updated kitchen well-stocked with equipment, dishes and staples. beautiful view of golf course and mountains. Table seats 8. Card/game table and many available games for all ages. Fireplace and Flat screen with Wii. Rent bikes at nearby lodge and use Bryce's awesome new bike trails. Boats are available for rental at 45 acre lake. Screened porch for eating on. Deck for star gazing and golf watching. Walk ( not ski) to slopes. less than 1/2 mile. Also sled on our own hill. Overlooking 10th and 16th green and fairway. Driving range and free putting range. Our housekeeper is on call to help you solve any problems on site. If ANYTHING is not top notch or you can't figure out operations or there is a bulb out - call her or owner. My family and I really enjoyed our time at the house and all the activities that are around the area! Beautiful house, lots of room, well equipped kitchen, PERFECT! Martha's house on Bryce Resort is an amazing place for a family get together... My wife and I enjoyed our first Thanksgiving with all our kids since the last one left home about 10 years ago and we could not have found a more perfect location! There are 2 bedrooms upstairs and a full bath and the basement has 2 more bedrooms with a full bath. There is a fireplace and nice sitting area in the basement as well. If you have any mobility issues like a hip surgery that went bad you will be fine on the main level but the circular staircase while beautiful is not easy to negotiate with mobility problems. Thank you for making your beautiful home available. We will never forget the wonderful experience we had there for Thanksgiving 2018! Very nice place. 2 thumbs up. Location was ideal. Beds were good. Kitchen had necessary amenities. Jet tub was wonderful. Great water pressure in showers. Quiet location. Comfortable furniture. Many tv channels if you choose. Our Family enjoyed relaxing and reading on both the deck and porch. Clean linens and towels were provided at a nominal fee. Fun family games were available for play. Plenty of space in kitchen and many rooms in the house for several guest. Thanks for your nice review. We aim to please and want you to feel at home. We hope you come back to enjoy the many things the Shenandoah Valley has to offer! Perfect location, perfect conditions, perfect layout, simply the perfect place for any trip to Bryce Resort! A great house for my two grown sons and I to share our golf getaway weekend. Very cozy, lots of space and a great kitchen to cook in. The view of the golf course was a fun diversion! Thanks for your review. I am so glad you had fun and hope you'll be back for some great golf and views! We met our kids and grandchildren at Niblick for the weekend. There were 7 adults and 2 children. The owner thought of everything and was very accommodating. The house was spacious, well kept and the view of the 16th hole was great considering the Azalea Classic was going on. The kids enjoyed watching the golfers, the planes flying in and out. The toys that were already there. I would highly suggest using this as a place to get away with family. It was perfect for us as we lived in NC and our children live in upstate PA. So this was exactly midway, great sites to visit such as the caverns, antique shops. Thank you Martha for providing us with a wonderful memory with our family. The Brooks, The Grubbs, and Great Grandma Williamson. The Chalet is central to all Bryce Resort amenities. Close to Shenandoah Caverns and other caverns, American Celebration Museum, covered bridge and many Civil War sites along Route 11. A perfect place from which to explore the Shenandoah Valley any season of the year. Check out new Biking Trails! Perfect for Foliage Viewing. Discounts for four day weekends and/or bringing your own linens.